While the mannequin challenge might be all the rage right now on social media, the island’s young people are working to start a different kind of viral trend – one based on kindness. 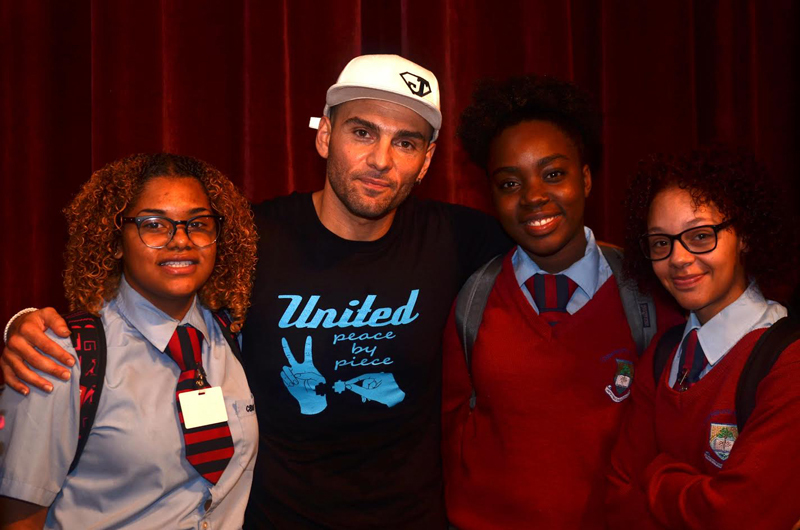 #LETEMKNOW, a challenge introduced to some of the island’s school students this week, was sparked by Chain Reaction Movement, a Bermudian pro-kindness charity. Young people were encouraged to let someone close to them know how much they appreciated them by shooting a short video clip, tagging their friend and uploading it onto the social media site of their choosing with the hashtags #LETEMKNOW and #CRMOVEMENT. Middle and high school students will have until December 10 to post their videos for a chance to win one of five Azad Watches. Worn by a host of celebrities and famous athletes, the watches are worth $1,000 each. 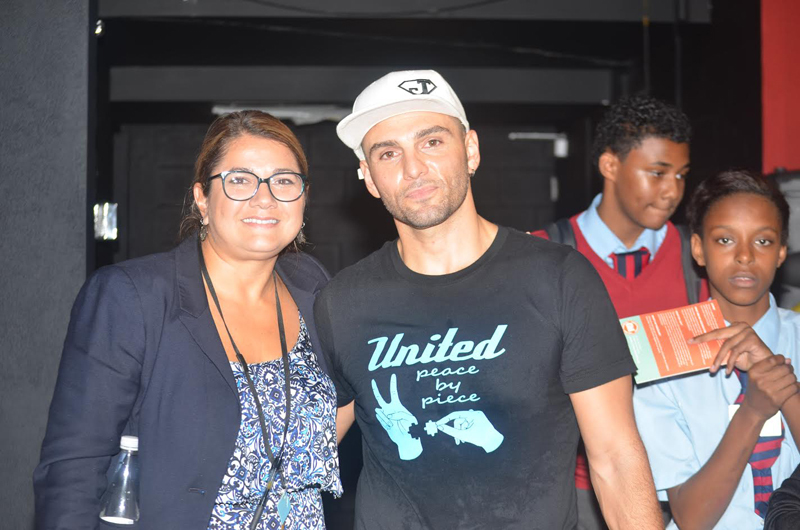 Announcing the competition rules on Wednesday was Poet Ali, a US-based entertainer and motivational speaker who has graced global stages in Italy, Spain, the UK, the Middle East and the Caribbean. He’s performed alongside celebrities like: One Republic, Christina Milian, Colbie Caillat, Fat Joe, Wyclef Jean, Lil Bob Wow and Akon. He discussed a book written by former palliative care nurse Bronnie Ware called ‘The Top Five Regrets of the Dying’. Ms Ware had the chance to speak to dozens of people while on their deathbed about things they were most upset to have missed out on in their life. People she spoke to wished they had the courage to live a life true to themselves rather than the life others expected of them; they wished they hadn’t worked so hard, had stayed in touch with their friends and had let themselves be happier. Poet Ali focused on the other regret people had: that they didn’t have the courage to express their feelings. “That’s a big thing in a lot of cultures around the world and a big thing in Bermuda, to brush our feelings under the rug and not talk about them or say it whether it’s good or bad, so we hope with the #LETEMKNOW challenge we’re able to start off a chain reaction or ripple effect so it becomes not just a one off to communicate positively with the people in their lives, but something that begins to feel natural and becomes a habit,” he said. CedarBridge Academy Principal Kalmar Richards said it was a “powerful message” and one she hopes students would learn from. “I hope they leave with the courage to speak their feelings and I’m hoping we will see more of that as students try to communicate in a respectful and caring manner. That’s an important skill to have,” Mrs Richards explained. S4 Student Rhyesheen Suragh, 17, said the presentation reminded her “to always try to make a difference” and “any small act of kindness goes a long way”. The presentation was also shared at Berkeley Institute, Dellwood Middle School and Sandys Secondary; while younger students at Northlands and East End Primary were this week introduced to the Chain Reaction programme. For more information on the kindness challenge #LETEMKNOW, visit Facebook: Chain Reaction Bermuda or www.crmovement.org. why does a middle/high school student need a $1000 watch? Give them an education fund instead. Don,t create jealousy, a spirit of envy, low self esteem. High achievers get big, big prizes, those who tried and failed to meet the established criteria will not feel good about them-selves. What is the criteria anyway 200 acts of kindness in 30 days ? The person who receives the act of of kindness, ought to see it as that only… and the person being kind should do it from the heart only.